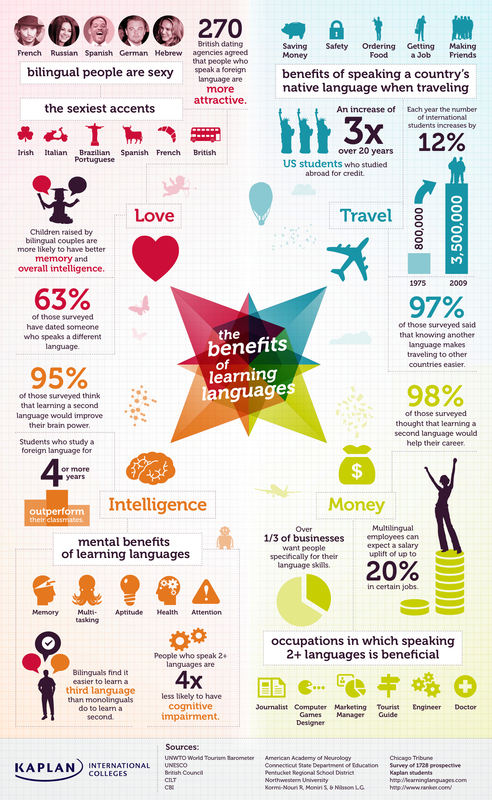 I found this infographic today on the benefits of learning languages. I think we have to take some of these suggestions with a pinch of salt but there has been plenty of literature about the long term effects of learning a language on brain development and maintaining healthy brain activity as we get older. Then again, doing sudoku, brain teasers, crosswords, in fact anything that keeps us thinking critically as we age, is beneficial. I guess mathematicians could say that learning maths is highly beneficial too…. However, as a language learner and teacher, I am happy to support the views this infographic proposes. After spending a week in Fiji, I was left wondering about how much better off to survive in the world many of the people in small islands who grow up speaking their native language as well as English are. They have all the benefits regarding brain health but also the ability to travel and work in other countries because they speak English, they can develop skills and communicate. Something which is only touched on in this infographic is the benefit understanding and speaking the language of a country you visit gives you in terms of understanding the people, how they think, behave, live. Having knowledge about cultural practices, societal norms allows you to get to know more people and helps you to be accepted into more familiar circles where you get to know the people and the country more intimately making your experience all the richer. I saw a great video recently that was all about the art of procrastination and I have decided that I could be a world champion if it were a competitive event. So, in the process of procrastinating, I end up surfing the web and finding all sorts of interesting (and sometimes not so interesting) sites that give me opportunities to get even more sidetracked and even further away from the job I am supposed to be doing. Any way, I found this blog which got me thinking – what sorts of things do I do and could I do at the beginnings of my lessons that will boost my students’ engagement and interest? 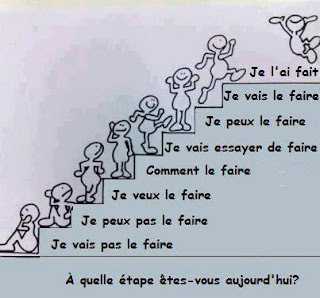 I also saw this picture that someone had posted on Facebook – this is a French version but I saw an English version of it a couple of weeks ago – would love to know if there is a Spanish version out there somewhere. So, where are you? I think I am permanently on the I am going to try to do, but that’s probably because I spend most of my time procrastinating and not actually getting on with stuff! And what sort of things do I do with my classes at the beginning of lessons? One of my favourite activities is using a piece of artwork and getting the students to come up with a Haiku in the target language. This usually forces them to focus on real meaning and they have to think concisely. Usually nouns and adjectives are the first words they think of and then come the verbs. Here are a few that one of my French classes did last year for this picture called “Tokyo Girl” by NZ artist Harvey Benge. I think it’s time to find a picture for my Spanish classes next week – never tried it in Spanish so will see how it works! Just spent 5 days at the NZALT Biennial Conference in Queenstown. We had the opportunity to spend the weekend before “immersed” in the French language which was brilliant! I haven’t spoken so much French for ages and it was so inspiring that even when we weren’t with the French native speakers we carried on speaking French. Then, even back at the Youth Hostel, we carried on talking French when there wasn’t any need to! We listened to some inspiring speakers as well as some who were not quite so inspiring and definitely had a lot to learn in the way of presenting skills – they would have been eaten alive in a classroom! Here are some of my notes and thoughts on John de Mado and Tony Liddicoat’s ideas that I can really relate to. I was also quite taken with Norhamin Abdul Samat’s session on learning language through Process Drama and found that lots of ideas ran through my head as she spoke as to how I could incorporate some of those techniques into the classroom. More on that later. The main problem I can see as I was listening to these inspiring people was how we can adopt these techniques for language teaching within the confines of an examination system that is traditional an narrow, and a results driven education system which has little space for experimentation if it means that in the short term result might suffer.